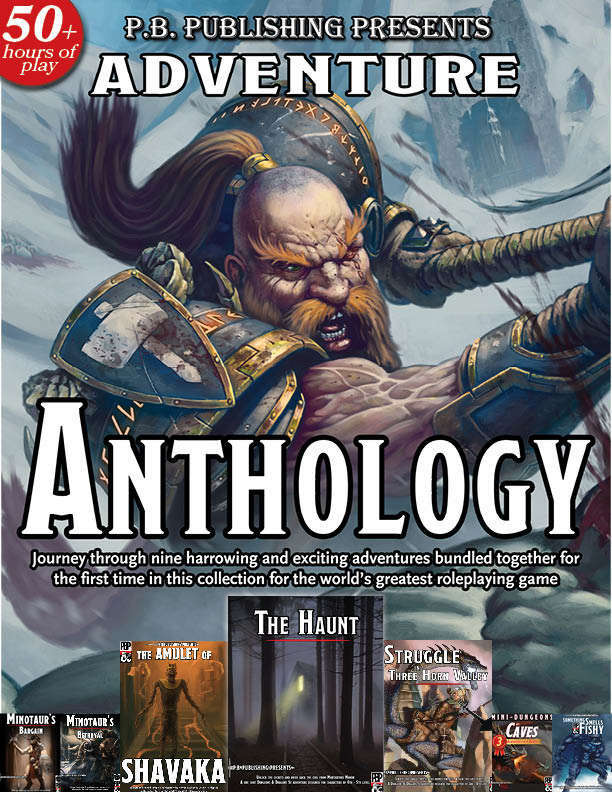 Adventure Anthology - NOW AVAILABLE!!! : CLICK HERE TO GET YOUR COPY TODAY! 4 of DMsGuild's best-selling authors: Phil Beckwith, JVC Parry, Roland Morgen and Chris Bissette! And over 50 hours of total gameplay and fun for your gaming group! Perfect for a Halloween one-shot! "My players were afraid to enter a room, but were also excited!" 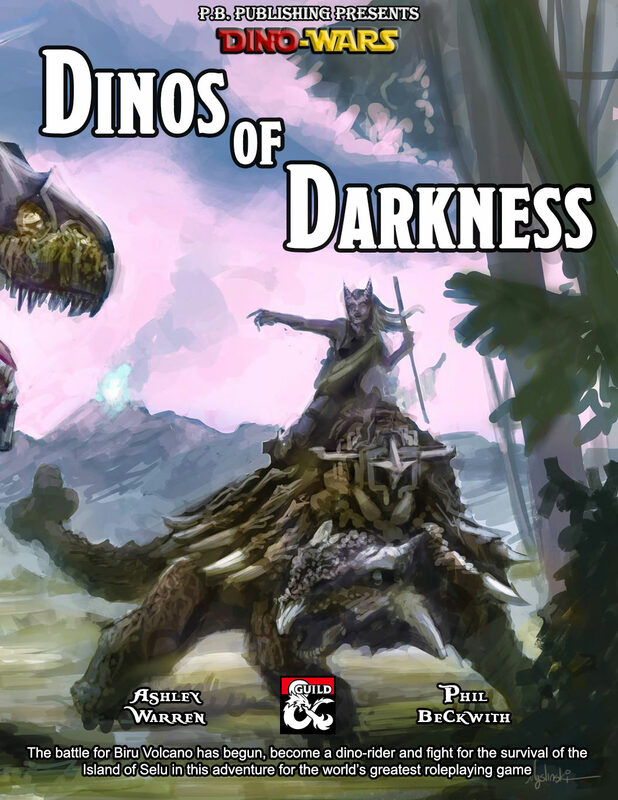 "My players had a blast and it was a fun adventure to run."... "they all enjoyed the atmosphere of the adventure and commented that the creepy stuff definitely felt creepy." "This is truly awesome. Well Done!" A one shot, 6-8 hour Horror themed adventure, designed for characters of 4th or 5th level. In ages past, an ancient town was lost and destroyed to a seige of orcs. Only one building survived and to this day, the manor is the only still standing building to be seen for miles around. Some say it is haunted, a few whisper of great treasures within, whilst others whisper that it is the manor itself that lives! No one knows for sure, only that a great evil haunts its halls. Do you dare enter Montarthas Manor?! DISCLAIMER! 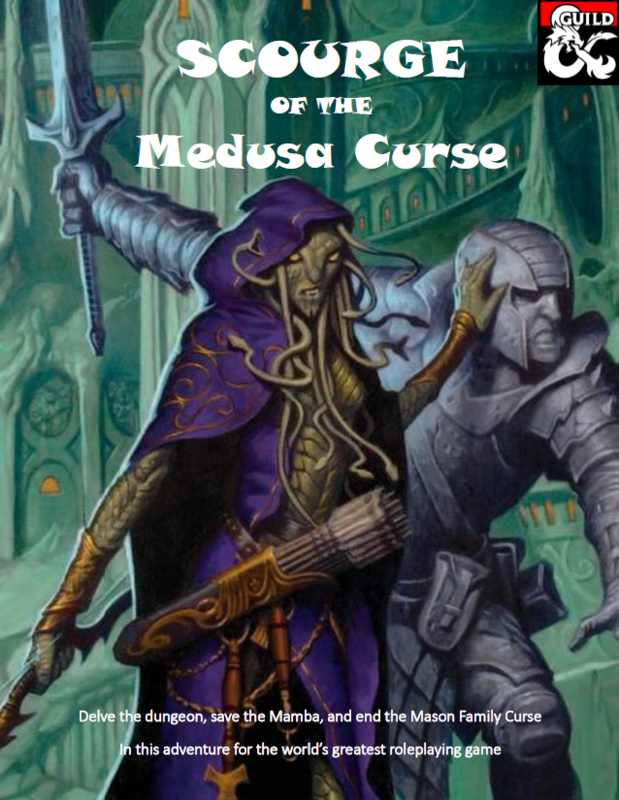 This will be a challenging adventure for 4th level player groups of 3 to 5 players with some deadly encounters. However, ideally The Haunt is tailored as a medium difficulty adventure with plenty of excitement, horror, suspense and danger for a 5th level party of 4 to 5 players. The Haunt 2 - Available now! "Perfect for a Halloween one-shot!" "It definitely help shed some light on the doll and the visions were so well written!" The terrifying SEQUEL to the bestselling, and Dragon+ Magazine featured horror adventure: The Haunt. 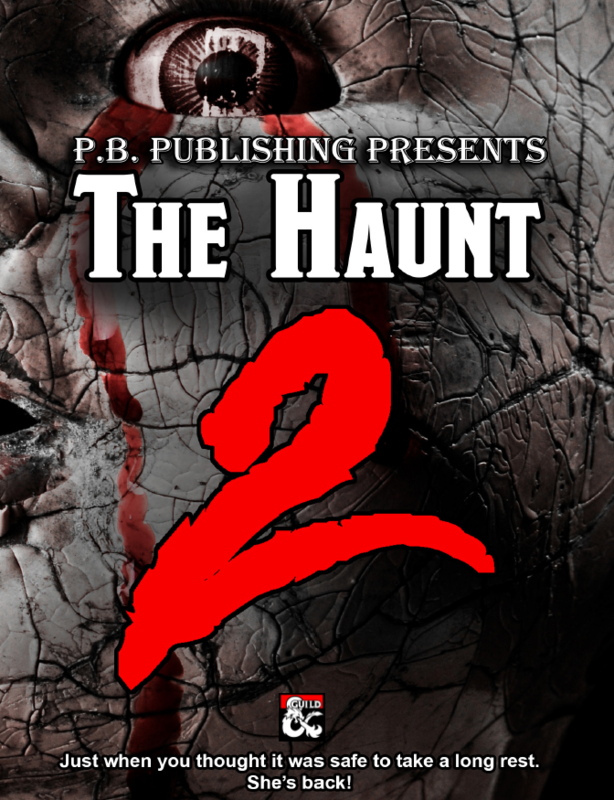 The Haunt 2 is both a one-shot, and a sequel that can be run as either. It is an 6-8 hour Horror themed adventure, designed for characters of 6th level. Can someone let me know what level they'd recommend for a group of three players? And: How accurate is the time frame of 6 - 8 hours? I've seen some people say they ran it over 4 hours. What's everyone's experience like there? I ran it last night and if you remove the basement it will be around 5 hours, depending on your group and if they split the party on the griffon statue or not. How would you scale this for an 8th level party? Hi Albert, You might be better using The Haunt 2 (made for 6th level characters) instead for a higher level party. It will be easier to scale up, and TBH it is a pretty difficult adventure to begin with. I would suggest making good use of the Bleeder Nurses in the Haunt 2 should you go that way. I recently purchased The Haunt and I am planning to run it in the next couple weeks. I have a question about part of the campaign and how it works. Can you please provide me with a way to contact you regarding my question? Ran this last night for my group. All but 1 (the stereotypical metagamer) was actually creeped out. The look on their faces when they saw the doll after the house crumbled was priceless more so when I said "...this is only part one"
Why this is tagged with the ToA Storyline ? It shouldn't have been, thanks for the heads up. Ran this one-shot last halloween, it was great. But just a tip; you might want to revise the Leecher's Emerald stat block. The main issue I see is that you state it has 2 charges, but there's no mention of having to use the charges for anything. It is in the same paragraph as the bit about using it to absorb health and it's heavily implied that using it as such costs a charge, but it doesn't actually say that. Thanks for the feedback Joshua! And great catch, we will revise and push out an update soon. Thanks for playing, and keep an eye out for The Haunt 2 this October. Oh heck yeah, I'll be all over it. Thanks for the great content! From what I've seen, this looks like a lot of fun, but I'm a bit confused as to the intended Party levels. On the cover it seems to imply level 4-5 characters, but I've seem some comments saying it's better for level 10ish characters? The party I'm thinking of running through this consists of 6 level 7 characters. How would that be? This adventure is written for Level 4 (Hard) or Level 5 (Medium) in mind. I think that for a level 10 party, this adventure will be a cakewalk. However, if you want to run it for level 10's I would suggest having only 2 PCs. I hope this helps, and I look forward to your review. Either I'm a bit thick or some of the markers seem to be missing from the maps. such as the "S1" marker for the secret doors. The x in the Alfresco to note the sword or a path to enter the area. I also don't seem to have a map of the basement. also loot details for Gertrude's heartstone and her soul bag would be nice. Thanks for the feedback, rest assured, there will be an update coming within the next couple of months. Along with a print version. Has the update happened yet? I just purchased this to run as a Halloween one-shot and the map still shows no entrance to the alfresco area. Thanks for the quick reply! I'm drawing out the map on 1 inch graph paper today. Also, there are no windows on the map. Should we assume that they're present, but magically sealed or some such? 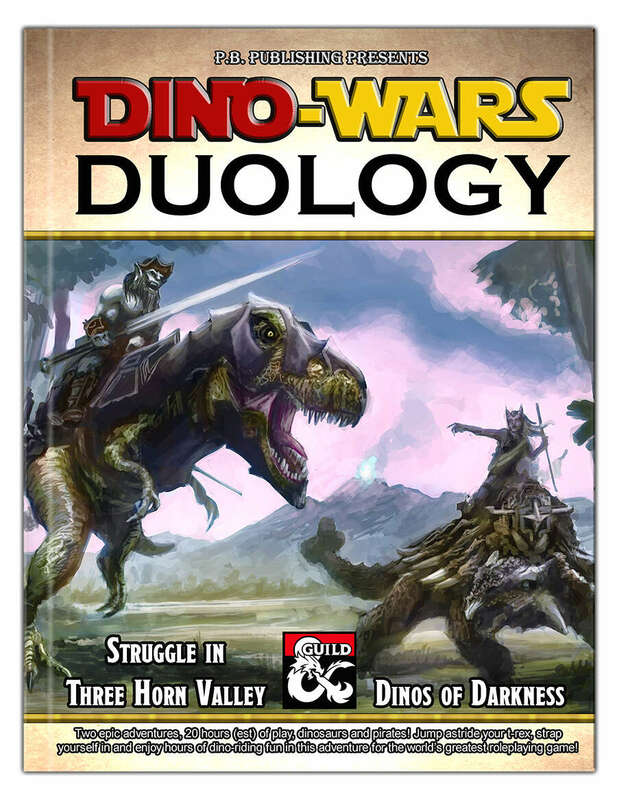 Hello, I just purchased this campaign for my group. I'm glad someone already asked about this. I don't see the map for the basement, has there been an update? 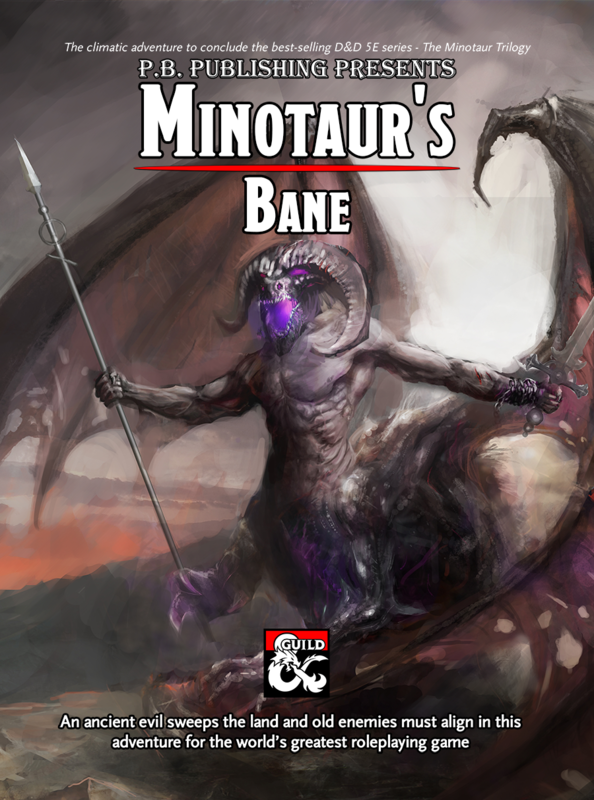 I will be running this one-shot for one player -- what level would you suggest I scale his character to? He's a very competent and resourceful player so I think he'll be able to handle the challenges, but I'm just not sure what an appropriate level for one character would be. I was thinking around 10, but would this be too high/low in your opinion? Has anyone else run this with just one player, and what was your experience? What level was the character, and did that work well? The player isn't afraid to have his character die, but I'd like for him to be able to play a good chunk of the adventure before dying, at least. Also, there appear to be two versions of the module in the .zip file: 2.1 and 2.2. Is there any difference? Some minor edits, use the latest version. 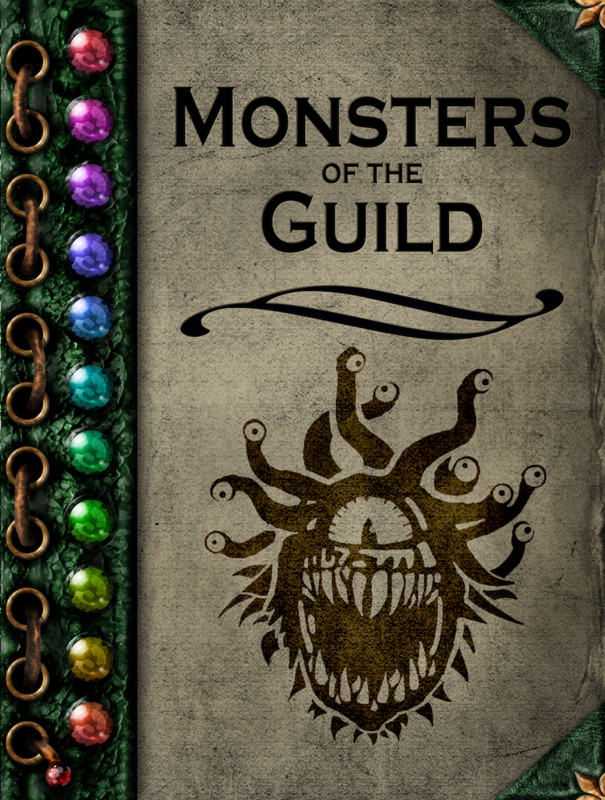 As for the level for 1 player... That is hard to state, but I would go by pg82 DMG for scaling... And work it against the beholder CR (hardest encounter in the module I believe). I will see if I can have a look later today. So after looking at it, you are probably going to want level 12 for it to be a medium difficulty. Level 9 and below for deadly. Bloody autocorrect should've said "...in the manor." Took about four hours to play through and our cleric decided to dive into the pool and almost died, but we all had fun. Light suggestions would be to show the glass door to the swimming pool, I took to drawing it into the map myself, additionally it would be nice if we had a token to cover the secret doors. Personally I loved he flesh golem, I may plan on him coming back at some point, not sure if he'll be friendly or not yet however but I really want my players to get a throw-back to this adventure. Wouldn't the token just scream "secret door here"? If it's just a section of wall you can slide over the door for a seamless appearance, why would it make anyone think there is anything there? It would just need to be scaled in line with the room, and a little effort in positioning from the DM wanting to hide things. I really want to buy this adventure, but i have a question, my players are 4 5thlvl and they are all a little bit op (raw but they just like to improve their characters as much as they can) and i was looking for a halloween oneshoot that does not depend so much on puzzles, having a few hard encounters, is this the one?? And thank you!!! This definitely seems like the adventure for you... the beholder, the gargoyles and the evil doll will all be challenging for them, even if they are OP... this is notorious for having the upper end of hard scaled encounters. There is even the possibility of a party split which will increase the difficulty more so. With this, I ended up with a TPK in the ghoul room with the doll. They tried to rest after taking out the ghouls and the doll entered from an adjacent room and started ripping through them starting with the watch. I'm about to sit down and start adapting this for a group of 5 level 7 characters. Any tips? I suggest adding a gargoyle to start it off, at the front door before entering. This will use up some resources and weaken them for whats to come. Also play the doll smart, use her shadow blend feature often. After taking a look, I have a question; what is the flesh golem supposed to do after opening the basement door for them? Do you expect it to simply stand there passively after that? Does it follow the adventurers? That is completely up to you, have him fight along side is "masters" ... could be a great way to drop random story elements that the players missed along the way, memories left over from the original owner of the brain perhaps? Love that, really shows the cruelty of the abomination and the horror it must be experiencing. Are there maps available for this to use in Roll 20? I'd happily purchase them. There are indeed, they are separate files with both player and DM maps, also with white background or transparent backgrounds for each. Thank you very much, sorry I missed that! 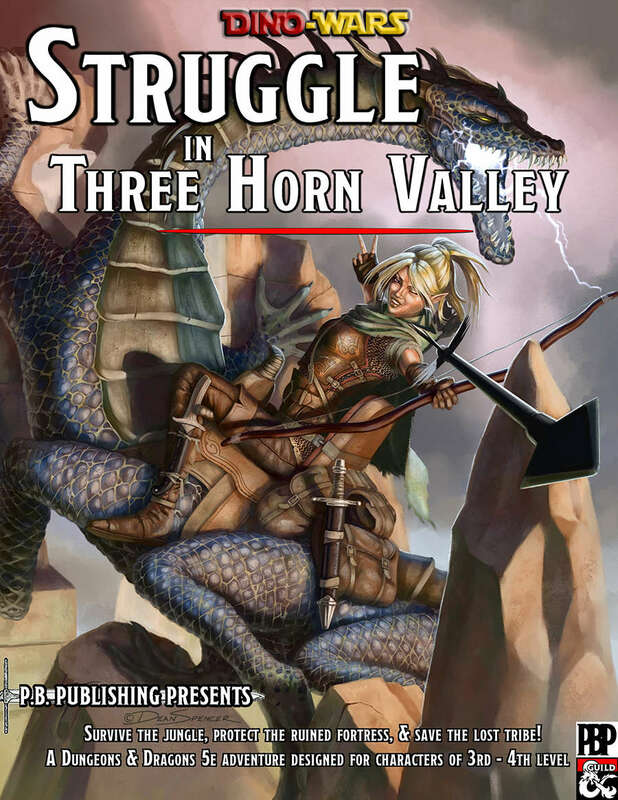 (I think I had seen the free pdf only of the adventure, which doesn't include maps). I suggest level 5... its the story and the atmosphere that gives this adveture its spooky reputation ;) level shouldn't impact that much.